Here comes another flavor in the veritable pantheon of Nissin Demae's lineup. It's curry flavor! I expected this one to be fairly straightforward since the powder packet should just contain mostly curry powder. Also, there should be no subtlety to this flavor: just make it taste like curry! As you might expect, the curry flavor ramen tastes fairly strongly of curry. In addition to this, however, there was also a hint of lemon and creaminess as well. It seems that Nissin Demae likes to give their broths a creamy texture. It's an interesting idea, but I think it is mostly unnecessary for a simple curry flavor. The noodles are Nissin Demae's standard noodles, which I tend to enjoy due to their slight crispiness. They definitely have a palm oil taste to them too, which makes them very distinctly Nissin Demae flavored. The curry flavor is OK, but is not really a bold flavor like I usually prefer from ramen. However, I would definitely recommend this one if you like curry or just want something mild. I realize that curry is not usually considered a mild flavor; in the world of ramen, however, it is relatively tame compared to some of the extreme fiery or seafoody choices. 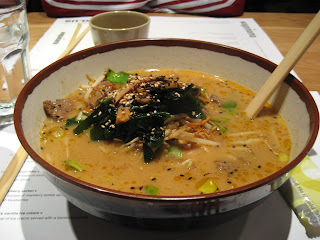 Ramen Ki-Mama - A Good Place for Your Mama! 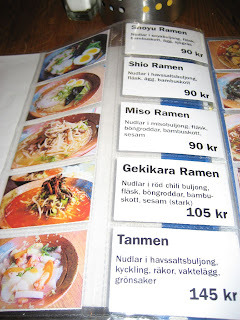 On a recent trip to Sweden, this ramen lover was thrilled to have the opportunity to try some ramen on a different continent. Ramen Ki-Mama's sister restaurant, Sushi Ki-Mama, is regarded as the best sushi restaurant in the city, so I had high hopes for its ramen. Fortunately, Ramen Ki-Mama did not disappoint! Our party of two arrived around 6 PM on a Thursday evening and was immediately seated in the clean but playful restaurant. It is a casual place, as evidenced by the self-serve napkins and chopsticks on every table, but maintains some sophistication with polished tables, a full bar area, and colorful wall murals. 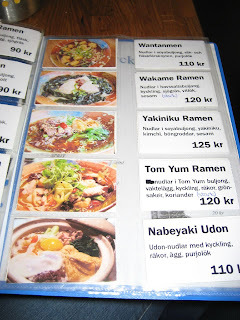 Ramen Ki-Mama offers the three basic ramens (shoyu, shio, and miso) along with a variety of more exotic combinations. While some of these combinations may be pushing the boundaries of authentic ramen, they do use Asian ingredients and flavors. The presence of the three basic ramens is enough to keep a traditionalist happy, while the creative ramens will satisfy more adventurous eaters. We ordered the shoyu ramen, which comes with roast pork, egg, bamboo, nori, and scallions, and the wakame ramen, which is spicy and comes with primarily chicken and seaweed in a shio broth. Both ramens arrived hot and with beautiful presentation of toppings over generous quantities of noodles. I was pleasantly surprised that my shoyu ramen was delicious and rivaled even the better West Coast ramen restaurants (or maybe my expectations were set low after my recent trip to Wagamama). 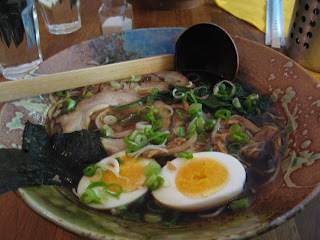 The pork was not too fatty, the broth was not too salty, and the noodles were cooked perfectly! The egg was also nicely warm, when all too often it arrives cold in a bowl of hot soup. 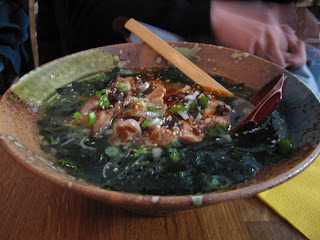 The wakame ramen was spicy but not overwhelmingly so, and equally as delicious. In short, you don't need to be in Asia or the US to enjoy an authentic ramen experience. 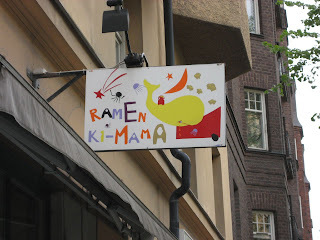 Next time you find yourself in Stockholm, head straight for Ramen Ki-Mama for a bowl of delicious noodles. Note: At the time of my visit, the exchange rate was approximately 1 USD = 6.8 Swedish KR. For many months, I had been eagerly awaiting the opening of internationally heralded noodle bar Wagamama in the US - first in Quincy Market and later this year in Harvard Square. I recently journeyed on a Thursday night to the newly opened Quincy Market location. Needless to say, I was disappointed by just about every aspect of my experience. First, the wait. Everyone knows that Quincy Market is a huge tourist destination, but on a sweltering Thursday night, it still took my group of four an hour to be seated. We were not given any buzzer that would allow us to leave the immediate area. Second, the seating. Instead of individual tables, the restaurant is set up with long cafeteria-style seating. So be prepared to rub elbows with giggly high school girls and sweaty fraternity boys, and to be churned out as soon as you're done with your meal. This is not a place to linger. Third, the menu. 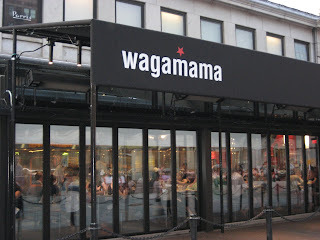 While I commend Wagamama for its sensitivity to various types of allergies, the statement that the restaurant "is modelled on the ramen bars which have been popular in japan for hundreds of years" is totally a piece of crock. Not a single ramen item comes with sliced roasted pork, the staple of traditional ramen, or a shoyu broth. Instead, Wagamama offers toppings like grilled chicken breast, grilled salmon, steak, and shrimp in soups of pork and chicken broth accompanied by non-traditional garnishes like lime and carrots. Fourth, the service. If Wagamama is high-tech enough to give its waiters wireless handheld devices, do they really need to draw all over my paper placemat? In addition, since Wagamama prides itself on making everything "fresh," the dishes are brought out to individuals one at a time. This means that one person in your party can sit and watch his/her food getting cold while the others wait for their meals to arrive at various times. My server was very nice and did everything she was supposed to - the problem was in the conception, not the execution. Well, at least you get free green tea. Last but not least, the food. I ordered the chili beef ramen, which is described as "noodles in a spicy pork and chicken soup topped with a marinated and grilled sirloin steak, fresh chillis, sliced red onions, beansprouts, coriander, spring onions and a wedge of lime." The dish was so overseasoned that the broth was completely inedible and the rest of the dish almost so. Every bite was dripping with sauce and oil. The steak itself was pretty good, but did not belong in a bowl of ramen. Generally, the flavors were so strong that it was hard to find any texture or subtleties. The portion size was disappointing and left me hungry to order Wagamama's overpriced and underwhelming desserts (which include such hundred year Japanese staples like chocolate fudge cake). I would like to note that this review was written about Wagamama's ramen specifically, and not the other noodle options available. In fact, some people in my group did enjoy their rice noodles. You might enjoy places like Wagamama if you're the type of person who thinks that PF Chang's is the epitome of Chinese food. But as far as ramen goes, for a more authentic experience, head straight to Ken's Ramen in Allston or Sapporo Ramen in Porter Square instead. Lately, I've found myself eating a string of Nissin Demae ramens. I'm not really sure why, 99 Ranch Market must have been having a sale or something when I picked these up. 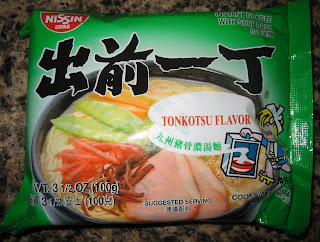 Anyhow, these are the Tonkotsu Flavor, which Sandi reviewed nearly 2 years ago! Tonkotsu flavor is a pretty popular style of fresh ramen, although not as popular as Shio (salt flavored), Shoyu (soy sauce flavored), or Miso (miso flavored). Tonkotsu broth is made out of crushed pork bones and is usually a milky white color. The first sip of this broth reveals its strong pork identity. One thing that I really like about Nissin Demae noodles is that they retain a tiny bit of crispiness even after being cooked in the broth. I don't like when the noodles get completely soggy like they do with those excuses for noodles that come in styrofoam cups. I thought that this broth was just too salty. Interestingly, this is a complaint that I also sometimes have with restaurant ramen. The plentiful sesame seeds are a pleasant departure from the ordinary and a nice touch. However, they can't rescue this broth which is just too salty. 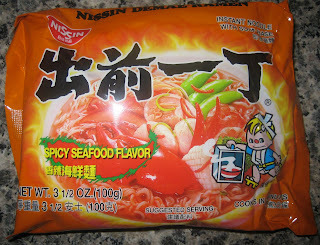 I usually consider the spicy seafood ramen flavors as the specialty of the Korean manufacturers. However, I was excited to see an offering from the Japanese ramen giant Nissin and more than willing to sample it. One problem that often plagues seafood ramen is the overwhelming pungent fishy flavor. 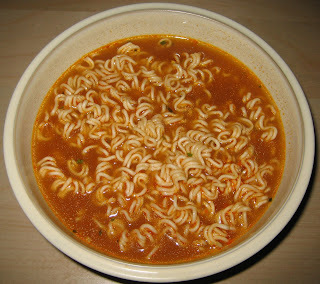 To counteract this, ramen makers often make the seafood based soup very spicy so that the broth is multidimensional. 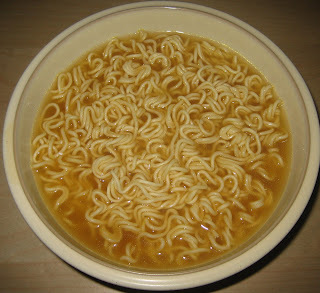 In this case, the broth was extremely garlicky and had a slight creamy nature that seemed to thicken it slightly. The spiciness was definitely strong but was almost deceptive. This is the kind of broth which you will be happily slurping away and then suddenly break out into a coughing fit from the spiciness. 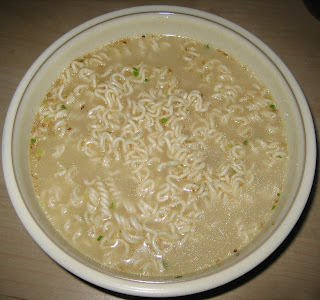 Not surprisingly, the noodles themselves are Nissin's typical noodles. Nothing special, but far better than the stuff that comes in the styrofoam cups. I liked that they decided to complicate the seafood flavor with garlic and spiciness. 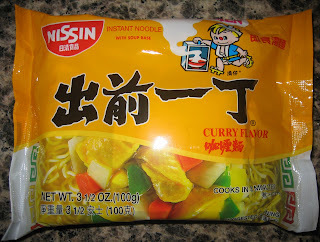 Altogether, I think that Nissin pulled off this flavor quite well. Still, it's not anything special in the wide range of spicy seafood noodles in the pantheon of ramen. Although I've never tasted this particular pack of instant noodles, I had a pretty good idea what they would taste like. 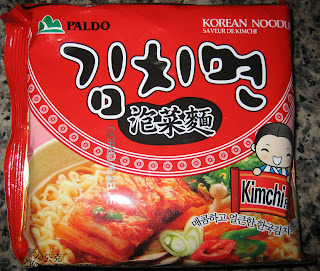 Most Korean brands specialize in hot and spicy flavors, but Paldo actually has quite an extensive line of non-spicy noodles. No surprises here as the broth turned bright red upon addition of the flavoring packet. As expected, the broth packed quite a spicy punch. Like their Korean brethren, the noodles themselves tended to be a little thicker and chewier. 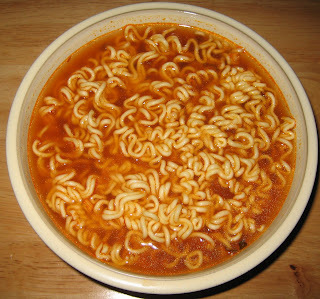 Honestly, the flavor of these noodles is practically indistinguishable from other Korean spicy noodles. With that said, they are still all very good and one of my favorite styles of instant noodle. My advice is to buy whichever one happens to be on sale that day!